The 44.8 metre motor yacht Logica, listed for sale by Burgess, has been sold with Michael Graff at Northrop & Johnson introducing the buyer. Built in steel and aluminium by Italian yard Logica Yachts to a design by Brenta Design, she was delivered in 2014 as the yard’s first yacht and is built to RINA class. An avant-garde interior by British designer Martin Kemp accommodates 12 guests in six cabins consisting of a massive main deck master suite with a private office and luxury bathroom, three VIP suites and two twins, all with entertainment systems and en suite bathroom facilities. The saloon’s contemporary design has comfortable seating on ivory coloured sofas and chairs, oak wooden floors and is decorated with leathers, luxurious fabrics and extensive mirrors reflecting the light from panoramic windows while forward is a formal dining area. Outside entertainment revolves around a spectacular 5.5 metre swimming pool located on the roomy foredeck. For sun lovers, there is a sunbathing platform above the coachroof. 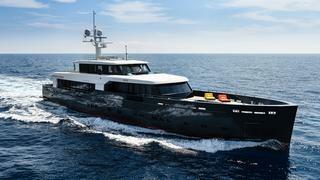 Logica made her public debut at the 2014 Cannes Yacht Show and, such was the industry’s interest in this ground- breaking yacht that the yard is planning a series of yachts designed along the same lines. She is powered by twin MAN engines of 1,320hp each, giving a top speed of 15 knots, a cruising speed of 14.2 knots and a range of 6,500 nautical miles at 10 knots. Logica was asking €15,900,000 with tax paid.